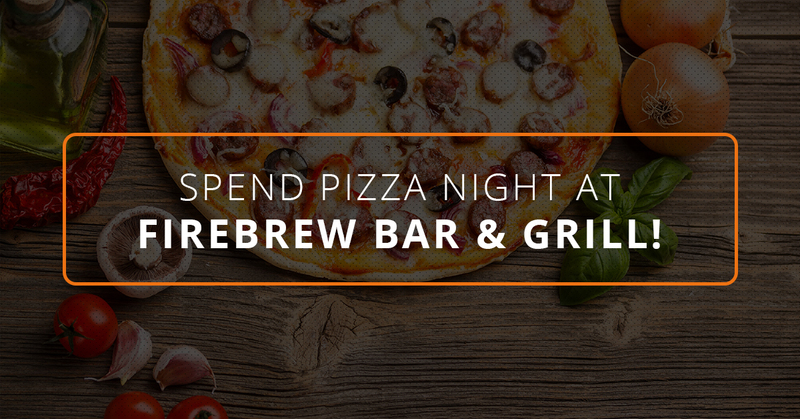 Spend Pizza Night at FIREBREW Bar & Grill! This pizza is a delicious blend of pizza sauce, mozzarella, provolone, Romano, mild cheddar, Monterey Jack, and parmesan cheeses. Don’t let the title fool you – this pizza may sound simple, but it’s one of our favorites. Take your taste buds to Italy with our Margherita pizza! Extra virgin olive oil, pesto sauce, diced tomatoes, fresh basil, and our house cheese blend all combine to give you a delicious, fresh taste. Whatever you think you know about barbecue chicken pizza, forget it! We use a unique tequila mango BBQ sauce to add flavor like never before to this pizza. This sauce, combined with chicken, bacon, caramelized onion, and a blend of mild cheddar and Monterey Jack cheeses make a strong, sweet flavor you’ll be thinking about for days. Who says your pizza can’t taste like a burger? This pizza features our house pizza sauce, Certified Angus ground beef and Italian sausage blend, Applewood bacon, jalapeno peppers, and mild cheddar and Monterey Jack cheeses. We make this pizza just like they do in the windy city! Pizza sauce, Italian sausage, pepperoni, mushrooms, onions, crushed red pepper, oregano, and our house cheese blend all combine to give you a hearty taste of Chicago. Vegetarians love pizza too! Try this combination of roasted garlic alfredo sauce, spinach, mushrooms, tomatoes, white onions, and our house cheese blend. Our original FIREBREW flatbread is topped with delicious veggies and toppings, including a spinach artichoke spread, tomatoes, corn, black beans, and our house cheese blend. We complete this dish by drizzling it with southwest ranch dressing. If you want your flatbread to be a little heartier, try our meat lovers! Pizza sauce, Kielbasa, Italian sausage, bacon, and mild cheddar & Monterey Jack cheeses on a grilled garlic herb flatbread – have you ever heard of a more incredible flatbread? When you are ready to indulge in one of our incredible pizzas, you’ll have to come in and see us! We have more amazing flatbreads and pizzas that we will discuss in our next blog. Until then, come to one of the best restaurants Virginia Beach has to offer – FIREBREW Bar & Grill. We know that we will be able to give you an unforgettable meal in a pleasant atmosphere each and every time. We will see you tonight for dinner, or even this afternoon for our lunch specials! Contact us today to learn more about our restaurant and our services.